Did you ever feel an inspiration? Not an excitement, not a pleasure of your own originality but the inspiration when immortal gods enlightened your mind, removed the vain husk which all of us have. This feeling partly verges on madness, fury of elements, and, in the same time, on devastation when you realize that you don't have a power even to stir. But suddenly new forces are arising inside you, bearing you ahead on unimaginably airy wings. We always follow different paths even the closest of us, they think of the same way but, in fact, it is different roads separated by slightly noticeable borders. The only essential point is where those ways lead to. To unlimited powers of the human spirit or into a dead end. ARYAVARTA is a way of the enlightened, of those who gained an insight, who attempts to make this world more pure and kinder. And for that, the Music as the most understandable language, accepted by all, has been chosen. You cannot really notice that a world that just has appeared in your imagination is shattering into thousand crystal pieces but in a moment it is solid again. The brutal roar of daemons destroying your peace is turning to the voices of angels treating your soul. You burn and revive, like Phoenix, in rote, in flaming shining of the sun, in phantoms of a mirage… Every time you observe a new scene as this Music can be seen and can be felt by each cell of the body. The way has been long but this makes an honor to the goers. And it seems that too many stopped to believe, far too many, and only the most reliable remained with whom we can go ahead. And the way, visible and audible and, above all, waiting for just them, has become crystal clear. 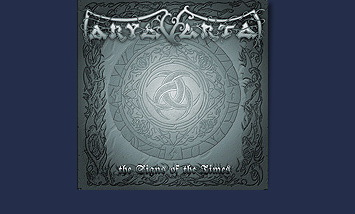 ARYAVARTA is not only the music, ARYAVARTA is also a community that is stronger than stones as it was forming through the creativity and the trials of life. When you try to press their Music into the frames of any direction, in a second it breaks through with a new unpredictable passage. Everything is proportionate and harmonious here but sometimes this harmony comes from a seemingly impossible musical form, from a combination of the incompatible. The Music was born in Valhalla, in the souls of men following the ways of heroes from ancient legends… This is also a lamentation about the lost, and a warning, and a majesty, and the beginning of a new world, and much else. You come inside the world that is before you, it can be seen every day, it did not disappear anywhere but do you have eyes to see what is evident? It is so easy to turn away from your path and to lose yourself in the vain and in the paltriness surrounding everyone. ARYAVARTA is the two men, no, it is far more as there were people on their uneasy way who just joined and went on with them, sometimes without any help except for their belief. The release of the first album seems to be the beginning of the way although many years are behind with lots of ups and downs… However, such Music is not being born in an hour as it must be endured, its every sound is a sound from the depth of the heart that is unable not to hear. Maybe these words will have sounded like pathos but I am barely trying to describe what can talk by itself, just turn on the CD… Then the music will have led you through the moods, while the words of songs interlaced into the tracery of poetry will have guided you along the border of this world, opening new horizons and pointing at a chasm separated from you by one step. In those words and the melodies you will see the unavoidable and the courage which fulfills those who go to battle. There is no place for injustice and stupidity in this world, everything black that poisons it is not hidden under shy masks… Before the gaze of this Music you are naked and open like an ancient book, it seems the very truth is talking to you, and ancient gods who were always beside are reviving. You are asking yourself a question whether you are able to go to the light by yourself. A magic of the voice entwined with the melody or a magic of the melody weaving the voice, it is impossible to say which is more important here, and every note is heard crystal clear. The guitars are singing or crying, or moaning with a human voice. It seems that the melody entangled in itself will stop, break suddenly after a while, and the very life will break with it, but no, from the storm of passions suddenly appears a theme of peace, contemplation, or conciliation, and immediately the idyll crashes as your conscious is encountering a battle, a battle with yourself… The Music asks you questions, it does not leave any space for indifference in spite of whether you are young or your life is approaching the final, and you can find the answers and the knowledge in it. The Music might be named epical but even this definition cannot express its essence. The epos is a wise narration while the Music transforms you, rises from the depth of the spirit, and changes the conscious. This Music is a Sign of the beginning of a new Time, the stalk of gods is hearable in its sound, the gods are opening the ways to the enlightened who can hear, feel, perceive and accept the knowledge of foundations of this world.